Author Tanya J. Peterson does not shy away from difficult subjects in her books. Having read two earlier, impressive books by Tanya J. Peterson, Losing Elizabeth (2012) and Leave of Absence (2013), I wanted to also read her new novel, which has been nominated for the Kirkus Prize, My Life in a Nutshell, published in 2014. Dedicated to the millions of people worldwide who live with anxiety disorders, My Life in a Nutshell, like Leave of Absence, is a novel about the debilitating effects of untreated mental illness. "I'm trapped. My chest constricts even more, and I'm suffocating. I feel like I can't get enough oxygen, and my lungs spasm again in a loud cough. Now that I've started coughing fully, I can't stop." My Life in a Nutshell is written in the first person from the point of view of Brian Cunningham, a school custodian who suffers from severe anxiety and frequent panic attacks. Tanya J. Peterson paints an astonishing, realistic picture of thirty-seven-year old Brian, who's mourning the recent loss of his dog, Oscar. The author presents his thoughts in a believable and often heartbreaking manner. Depressed and full of self-loathing, Brian dreads interaction with people, and avoids it as much as possible. In spite of his feelings, he cares a lot about his work, and he genuinely wants to help others. On the first day of the new school year, he discovers Abigail Harris, a seven-year-old foster child who's been abused and who now lives with her aunt and uncle, hiding behind his cleaning cart in the mechanical room at school. After he helps her put on her shoes, she asks Brian if she can live with him. This chance meeting is the beginning of a new chapter in their lives. If I had to describe this book in one word, I'd choose the word intense. Through the thoughts of the protagonist, I felt as if I were experiencing the chronic, agonizing anxiety and panic attacks that afflict Brian. My Life in a Nutshell is powerful, incredibly real and compelling. I felt immediate empathy for Brian and Abigail as I read this book. Both characters are quite likable, and it made sense that their friendship would help them. From the first chapter, I was hooked by this book. Brian's story convincingly depicts mental illness, and I was swiftly drawn into his world. He's a wonderful, caring person, yet he calls himself an idiot in the first line of the book; he loathes himself. It is heartbreaking. I wanted to find out why Brian felt the way he did about himself (readers do not learn about what happened in his life or its aftermath until much later in the book). He's led a socially isolated life, is very uncomfortable in social settings, and has only one friend, the day custodian, Roger. Although Brian suffers from extreme anxiety and struggles on a daily basis, he's a good and kind person, and he's also quite intelligent, and particularly sensitive to the needs of Abigail. Brian knows he needs to deal with his recurring, troublesome anxiety, but he has a hard time getting that help, for numerous reasons. Very reluctantly, Brian goes to a counseling appointment that his mother has set up with Dr. Beth Greene. The first appointment is not easy for him, but he does realize that the counseling will help him to cope. As Brian and Abigail form an attachment to each other, they help each other, and the story is ultimately about friendship and love, and trust and hope, which all contribute to mental health. My Life in a Nutshell highlights the value and importance of mental health. It shows that purpose and positive social interaction contribute to mental health, and that counseling may help, in many instances. Brian's thoughts are a major part of this story, which make you think about your own self-dialogue: are you mostly positive or negative? Are your thoughts obsessive, or healthy? In a more general sense, the book compels us to be less judgmental of others, and more understanding. It reminds us not to evaluate others solely (and negatively) on the basis of occupation ("dumb" janitor, "lazy" housewife, etc. ); get to know people--you might be surprised! My Life in a Nutshell is a wonderful and hopeful book that I'm honored to have read. Although often overlooked, mental health is an extremely important facet of overall health. Warm thanks to author Tanya J. Peterson, who writes sensitively and beautifully about a challenging subject, for inviting me to participate in her book tour and for sending me a copy of her book. 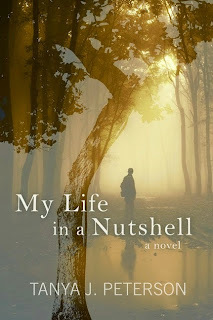 For more reviews of this book, please visit the other stops on the My Life in a Nutshell book tour. Wow, what a great review! You've made this sound like a must read for those who suffer from anxiety and for those who want to understand it. The book sounds good and I love the cover! Sounds like a topical read. I think novels dealing with these issues can be so useful if well done as this sounds to be. Great review, thank you. This is a book I'd like to read, even though it's intense, it sounds very revealing and eye opening. Great review! I'm going to see if my library has this. I suffered from panic attacks for many years. Suberb commentary on this one Suko. You really seemed to convey a lot about this book. Not only am I particularly interested in anxiety related ailments but this does sound like a really well written work. I will try to give this one a read myself. Wonderful review Suko. You've mentioned important points that this book brings to light. I am going to add this to my To Read list. Thanks for your review. This sounds like a wonderful book on a subject that needs to be talked about more often. Wonderful review. Great review! Sounds like an excellent book. Wow, this does sound intense! Great review! My Life in a Nutshell does sound intense and like it deals with a subject that does need more discussing. Great review Suko! This sounds an excellent book, I'm always interested in reading fiction dealing with mental health, and I like the sound of how this character is depicted, thank you for reviewing this one. I know a few people who would like this book. Thanks for telling us about it!